With Spring 2011 almost upon us I have been preparing for another season of nature photography on my own doorstep. In my home town of Houghton le Spring you'll find Rainton Meadows Nature Reserve, which is more than handy for me as it's only a few minutes drive to the site. Rainton Meadows and Joe's Pond can be found by following the brown signs from the A690 between Durham and Sunderland. By bus, the services 222 and 220 regularly leave Park Lane in Sunderland, or the bus station in Durham and set down at the nearby Mill Inn. There's a short walk under the A690 continuing until you reach the last roundabout of the industrial estate. The entrance to the Reserve is called Mallard Way. During the Spring and Summer months I make regular visits, usually with my son who gets as much enjoyment from the place as I do. Many species of wildlife can be seen here, including Foxes, Hares, Rabbits and Owls, as well as breeding birds such as Swans, Geese, Grebes, Kestrels and Warblers, to name just a few. Armed with a 300mm lens and Canon 7D body I usually pull in some decent shots, especially during April to July when the Mute Swans are nesting and the cygnets readily feed from visitors - subject to parental approval of course. Don't get too close as you might get a clout! There is normally two new families of Mute Swans on the reserve each year and each nest is normally visible from the designated paths. Swans usually pair for life and have elaborate courtship rituals including the famous heart shape they make with their necks. They normally start breeding in their fourth year. The male, or cob, is larger than the female or pen and when together the longer neck, larger webbed feet and larger black berry of the male make identification much easier. Unfortunately many young swans die each year but some live to about 25 years in favourable conditions. The cob will establish a territory large enough to supply his future family with sufficient food and will valiantly defend it against all comers, whether they be other swans, foxes or intrusive humans. Swans are protected birds and it is illegal to harm them or steal their eggs. The male and female choose the nest site together and use any material within about 40 feet to make the nest. The pen lays between 1 to 12 eggs, the average being 6. The eggs are laid every other day and only when the last egg has been laid does incubation start. The incubation period lasts about 35 days and the pen only comes off the nest for very short periods to drink and stretch her legs. The cob takes over after a recognition head lifting ceremony. The cob will defend the nest against foxes, dogs and other predators. Cygnets normally take to the water 24 hours after the last cygnet has hatched, usually in May. The parents do not feed them, but the pen will 'foot paddle' to bring food to the surface for cygnets to eat and pull out reeds which the young would otherwise be unable to reach. One parent will always be on guard and they often travel in line with one parent at the back, the other in front. The pen will carry the young ones on her back. The swan family is very close and if a cygnet is lost, the parents will often look for it up to a week. Natural predators are pike, foxes, mink and cold wet weather. Unfortunately man poses further hazards. Nature has been clever with the swan's moulting period when they cannot fly. The moult takes about 6 weeks and for non-breeding birds takes place about July time. 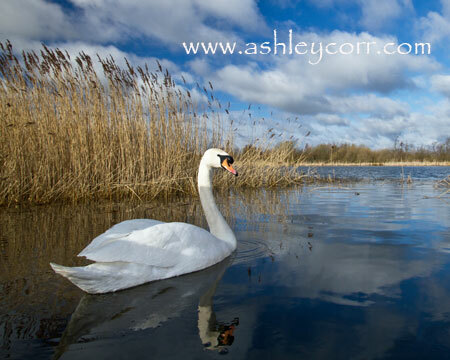 A pair with cygnets moult at different times, first the pen and then the cob in August to September so that one of them can always defend the young. Here is a couple of photographs I took on Sunday morning (27th Feb) - the first was taken at Rainton Meadows (Pond 1) and the second at Joe's Pond which is situated at the other end of the reserve, near the Rainton Bridge Industrial Estate . Lastly, I have uploaded a short video clip of a nest site in the reeds at Pond 1, captured last May, showing newly hatched cygnets. Only a few chicks are visible but the full clutch of ten eggs hatched successfully. A nice taster for what is round the corner in 2011. Spring is almost here! Skyclad are often referred to as ‘The Originators of ‘Folk-Metal’ – a sub-genre of metal that mixes thrash/speed metal elements with traditional instruments and folk-style melodies – as typified by their seminal album ‘The Wayward Sons Of Mother Earth’ (1991). The band produced a string of highly acclaimed albums – ‘A Burnt Offering For The Bone Idol’ (1992), ‘Jonah’s Ark’ (1993), ‘The Prince Of The Poverty Line (1994) and ‘The Silent Whales Of Lunacy’ (1995) - and gained a reputation as a powerful and energetic live act with many European tour and festival appearances (such as Dynamo Festival, 1992). During the late 90’s, despite several line-up changes, the band continued to develop and experiment with their musical style - producing albums such as ‘Irrational Anthems (1996), ‘Oui Avant Garde a Chance’ (1996), ‘The Answer Machine’ (1997) and ‘Vintage Whine’ (1999) – they even undertook several ‘unplugged’ tours across Europe alongside appearances at festivals such as Wacken Open Air (1998) and ‘The Gods Of Metal’ (1999) before returning with a more ‘metal’ album, ‘Folkemon’ in 2000. Whilst Folkemon proved to be the last album for founder member and vocalist Martin Walkyier, the band decided to continue and released the ‘Swords of a Thousand Men’ single (featuring ‘Eddie Tenpole’ himself) and the ‘unplugged’ album ‘No Daylights Nor Heeltaps’ in 2002. A new studio album ‘A Semblance Of Normality’ followed in 2004. As well as having all the usual folk instruments and influences, this album also featured the Royal Philharmonic Orchestra and was well received by both fans and media worldwide. 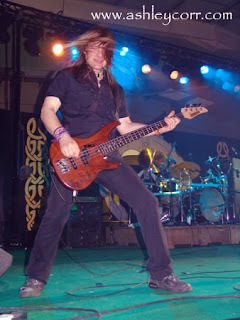 ‘Semblance’ marked the start of an exciting new chapter for Skyclad, who, while continuing to play in strongholds such as Germany (Dong Open Air, 2003 & 2005 and Burgfolk, 2004), also made successful appearances in new territories such as Sweden (the ’34,000 ton of Metal’ Cruise, 2004), the Czech Republic (Rock Café, Prague, 2005), Finland (Tuska Open Air, 2005) and Portugal (Beja, 2005). All this live work culminated in a full European Tour in early 2006, which took in ten countries, and the release of the ‘Jig-A-Jig’ EP – which the band produced themselves as a special one-off release for the tour. Since then, as well as playing gigs and festivals across Europe – including the ‘Battle of Metal’ 2007 and Club Tochka in Moscow in 2007 and ‘Folk’n’Roll 2008’ in Pecs, Hungary - Skyclad have written and recorded a new full-length studio album (the band’s twelfth). Entitled ‘In The…All Together’, this ten-track album was recorded in Italy during August 2008. Again, as with ‘Semblance’, Dario Mollo engineered and mixed the album at his ‘Damage Inc’ studio in Ventimiglia. However, unlike ‘Semblance’, this album was recorded completely by the band members – so there are no ‘guests’ or orchestras etc. This was a deliberate move to try and keep the recordings as ‘live and fresh’ as possible and one aimed at taking the band into the studio ‘all together’. This wasn’t exactly a ‘back to basics’ strategy, as the songs on the new album are far from basic as the band continues to experiment with odd timings and tunings. Another benefit of this approach is that Skyclad will be able to play more of the album songs live. ‘In The… All Together’ is scheduled for release by Scarlet Records in late spring 2009.The band continue to record and tour in 2011, continuing the Skyclad legacy that is now into its 22nd year! I'd previously met the members of Skyclad, in late January 2004 and again a few weeks later. The first occasion was to photograph them separately as they needed headshots for their forthcoming album sleeve. 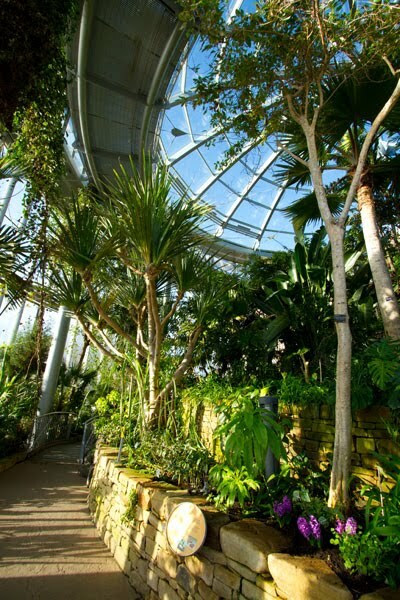 The second meeting was at a local venue, Bede's World, where I took some location shots of the band as a unit. The resulting shots will be uploaded here in another RETRO entry - coming soon! In April 2004 I was invited to photograph Skyclad at the Celtic Warriors 12th Birthday Bash in Huntingdon, Cambridgeshire (same bill as The Quireboys). By the time Skyclad entered the stage the venue was filling up quite nicely, but still fairly short of capacity. From memory, I think they were pencilled in for a forty minute slot, before ageing rockers Saxon took their turn. The band kicked off with a couple of songs that typified their opinions of disapproval towards government rule down the years - outspoken tales of torment, quite often shared with others during a drunken stupor. 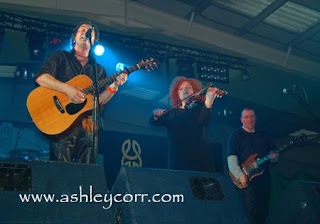 Seven years on it's not easy to remember the full set-list of songs that Skyclad delivered, but notable inclusions were Parliament Of Fools, Another Drinking Song, The Widdershins Jig, Penny Dreadful and Inequality Street. The audience lapped it up, which was a surprise to me because I felt Skyclad were 'Off the wall' compared to the more heavier metal bands on the bill at Huntingdon. Biddle on the fiddle is a prime example of that - I mean, how many metal bands include a violinist? It didn't matter though, as Skyclad were up there on merit and this was reinforced by appearing so high on the bill, with only Saxon and The Quireboys ahead of them on the day. Frontman Kevin Ridley was well up for it - his banter between songs was very amusing and kept the crowd entertained. It was almost as funny as his inability to pitch a tent just a couple of hours earlier on the nearby field! Oh well, tents and rock gods don't go hand in hand, do they (wink). A mixture of acoustic and electric guitar gave a nice blend, courtesy of Ridley and Steve Ramsey, the 'Bouncer' of the group. Graeme English, or 'Bean' to his friends, powered in with some strong bass lines just in front of my camera - I managed to capture one or two of his 'moments' during the show, as seen here. Couldn't help but laugh at his regulation steel capped boots on the day - I have a similar pair - Arco, I do believe. All in keeping with rough and ready image of the preverbial rock star who couldn't give a gnats chuff. At the back, as per, was young drummer Arron Walton, who I couldn't reach with my bog standard lens so he doesn't appear on this blog - sorry mate! A polished performance nevertheless. Probably the highlight of Skyclad's performance was when Georgina Biddle stepped off the stage during a song and played fiddle in the photographers pit, right next to us. The crowd showed immediate appreciation by cranking up the noise levels, before she vanished backstage. The forty minute set was over in a flash - where did that go! It was time for the encore, a blast from the past in the shape of 'Swords Of A Thousand Men', the Tenpole Tudor song from 1981. I'd been tipped off about this song being the encore, so I switched my camera into movie mode and filmed the whole song - 3 minutes duration. The audio is quite distorted due to the position I was filming from, just feet away from the PA speakers. Shot in Mpeg, the video is included here on this blog entry - not HD quality by any stretch, but a recording that sits nicely in the archives and a permanent reminder of my debut in the photographers pit. SKYCLAD VIDEO FOOTAGE (above) - Swords Of A Thousand Men. Welcome to my new RETRO blog entries, where I revisit past times when the camera was once again at my side. 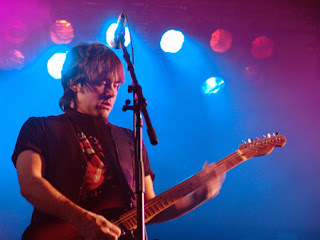 My first RETROspective blog entry is an account of a live music concert that I attended a few years ago. The event, in April 2004, was the Celtic Warriors 12th Birthday Bash in Huntingdon, Cambridgeshire. The all day event was held at an unusual venue - an animal shelter! Rockers, Hells Angels and anyone wearing black attended the event which also offered overnight camping on the adjacent fields. Proceedings kicked off shortly after lunch time as over a dozen bands appeared on the bill. Most of the bands fell into the Heavy Metal category, with a couple of tribute acts thrown in for good measure. The shelter was half full during the afternoon and on entering the venue we were met by a sea of black and more leather than a SCS warehouse! 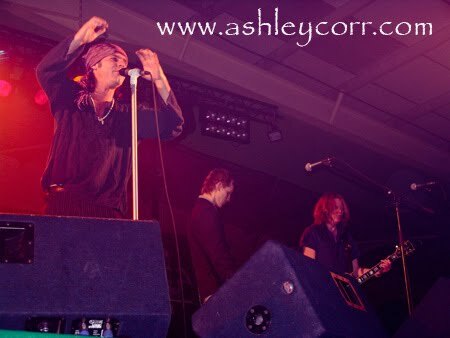 The Quireboys are an English hard rock band formed in 1984 in London, England, with strong ties to Newcastle. When the band formed they were originally known as The Queerboys and later as the London Quireboys in the United States. The band were successful during the late 1980s and early 1990s, with their debut album A Bit of What You Fancy reaching number 2 on the UK charts. Their highest charting single for the band was with the song "Hey You", it reached number 14. With a new drummer, Rudy Richman, they began working on the follow-up, Bitter Sweet & Twisted, which was released in 1993; but the birth of grunge changed the music scene and they were left behind. Axl Rose asked them to join the "Use Your Illusion Tour" with Guns N' Roses, and they followed the band for a while during their 1993 summer European tour. In 1993, the Quireboys broke up but briefly reformed live in 1995 with different members. 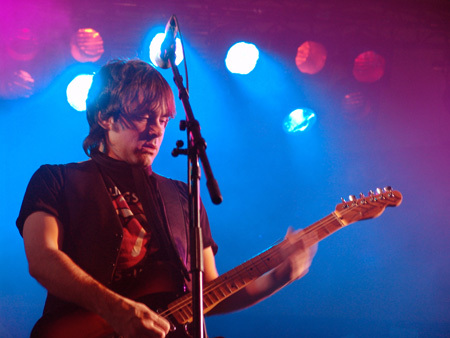 A more permanent reformation came in 2001 when frontman Spike, guitarist Guy Griffin and bassist Nigel Mogg put together a new line-up. The band is still active, recording new material and playing live. 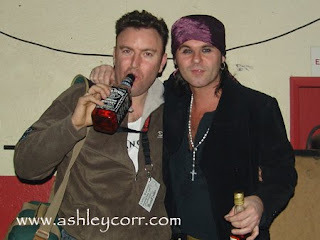 In 2010, The Quireboys teamed up with Def Leppard singer Joe Elliott to record an album under the name 'Down N Outz'. Two singles have been released to date, both of which are covers of Mott The Hoople songs: England Rocks (June 2010) and Overnight Angels (January 2011). Down N Outz will be supporting Paul Rodgers on tour in April 2011. Backstage was a bit of an eye opener. The brick shithouse of a bouncer let us through the security gate after we flashed our passes and we were met by a guy sitting at a table who's job it was to make 'rock n'roll cigarettes' for all who fancied one. I politely declined the offer before walking through to the dressing room area directly behind the stage. After a few minutes I felt half-stoned just from passive smoking. I'm pretty sure on a clear day you'd be able to see the main stage!!! As Quireboys were preparing to hit the stage we had a chat with Spike, lead singer of the band, who introduced us to one of the guitarists who was from Blyth in Northumberland. Spike insisted that we shared his bottle of Jack Daniels as we chatted. Not being one to turn down a free swig of the good gear I duly obliged, as a flashgun went off in front of us (see photo 1). I then took a photo of Spike with his rather gorgeous girlfriend - the lucky so and so. And that was that. The MC introduced Quireboys and the lads made their way onto the stage, accompanied by the theme music from the 1970's TV show 'Whatever Happened To The Likely Lads'. At this time we headed past the engineers desk and out front and into the photographers pit, facing hundreds of rockers in the audience as we went. Sitting next to the barrier facing the stage I got me hair ruffled a few times off the rock chicks directly behind me. Nowt to do, other than laugh it off, he he. The show was quickly underway and the place was jumping. I'd never seen Quireboys play live so I was looking forward to what they had to offer. It was Rock n' Roll all the way. I photographed at will, between supping Stella Artois from the stock of four tins I'd bought earlier from the bar. The PA system right in front of us done nothing for our hearing, although the music was good and not too distorted. This was loud stuff alright. After three songs me heed was ringing and the 5% dizzy watta didn't help either. God knows how I managed to get some decent shots - I was dizzy as the preverbial duck - some people coin the phrase 'Pissed as a fart'. Aye, that was me! It was a great night and one that I'll always remember. These AAA passes are a bit of alright. I'd write more but that's all I can rembember, to be honest. The rest, as they say, is just a blur! More RETRO to follow. Thanks for reading. With a couple of hours to kill I made an early evening mid-week trip along the A690 towards Durham City - Land Of The Prince Bishops. 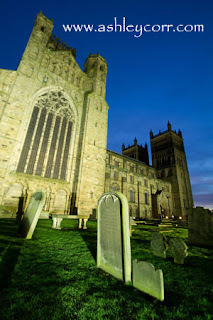 This would be my first visit to Durham Cathedral with my recently aquired Canon 10-20mm wide angle lens, so I was looking forward once again to seeing more results via the new glass. The change in temperature was very noticable as another Spring season seems to be nudging ever closer. The walk from Prince Bishops Car Park to the Cathedral was a short one, taking no more than five minutes, so it wasn't long before I was on site and ready to pull in some decent shots. Palace Green and the adjacent Durham Castle were quiet areas, for a change - they're usually busy parts of the City Centre, but I wasn't complaining. I took up position at the front of Durham Cathedral, near the gravestones, before I took my first shots. Didn't hang around for long though and disappeared into the building, which was also very quiet, give or take the odd visitor or two. 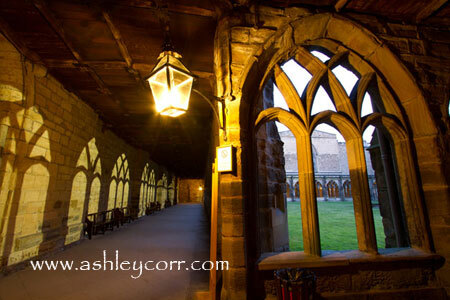 It was then that I passed through the Cathedral into The Cloisters, where the monks dormitories and Chapter House can be found. Bright lights cast shadows across the walls of the Cloisters, which presented an ideal photo opportunity, shown here in my second shot. 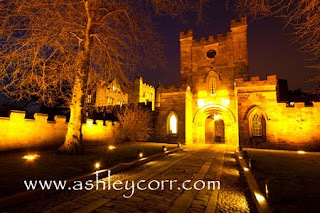 After leaving Durham Cathedral I headed over to the nearby Durham Castle, which was illuminated and drawing me in like a moth to bright light. Another focal point of Durham City Centre, especially at night, and given more time I would have photographed from inside the castle walls. Quite pleased with this third shot though, which is a good example of a castle that has stood the test of time - a building that will be around for many more years to come. The Tawny Owl that roosted on the branches above me would have made a decent shot too, so I must get my act together and buy a 300mm telephoto job. Can't be missing out on shots like that again. More shots from this visit can be seen in my Durham Cathedral Gallery on my site at ashleycorr.com. before I started my blog page 18 months ago. Some of my archive stuff dates back to the 80's, a time of big hair and silly clothes, amongst other things. I'll be on a few of these shots myself, which will guarantee a good laugh, he he! So hang around, I'll be starting my new RETRO series in the next few days. A few weeks ago I received an order for a large quantity of postcards that I recently designed. 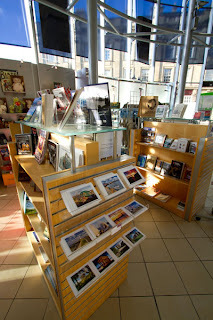 The destination of the cards was Sunderland Winter Gardens & Museum, which is a new outlet I now supply to. 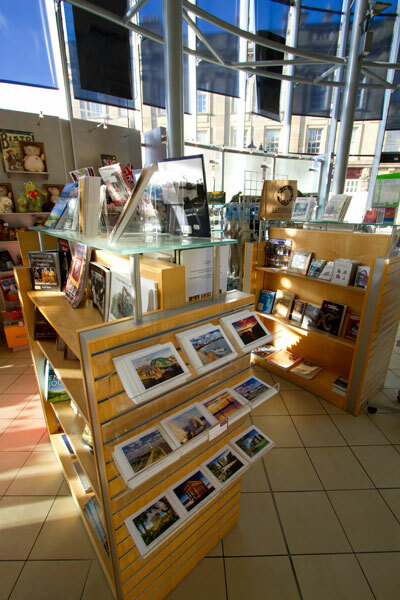 The postcards, of local scenes in and around Sunderland, were on display in the gift shop and it was nice to see them sitting alongside other crafts of local interest. There are eleven cards to choose from, all of which follow a similar style and carry their own number on the back as part of a set. The full set consists of seventeen cards at present, with more designs to follow in 2011. I am hopeful that the Winter Gardens & Museum will shortly be stocking a selection of my limited edition mounted prints, but as yet nothing has been confirmed, so it's a case of 'Watch this space'. I had a quick look around the Winter Gardens before I left the building, taking a few shots along the way. The place is very well maintained and although it was fairly quiet, I imagine it gets quite busy during peak hours. Had a little chuckle when walking past the museum entrance - there it was, the first Sunderland built Nissan Bluebird, in Arctic White. If I rembember correctly it was presented to Prince Charles but he donated it back to the Museum some years later. I wonder why? Maybe he wasn't too keen on it - who knows. Nissan build much better cars these days - have you seen the Cube!!!!!!! he he. With the days starting to get longer and the nights getting lighter, I'll be out and about with the camera in the next few weeks. No more sunrise shots until the back end of 2011. Can't be doing will 4.00am starts in the summer - no thanks. Spring is almost upon us and I've got my eye on a 70-300mm Canon lens for some nature shots. The 10-22 wide angle lens will be put to the test with plenty of landscape shots, so there's enough to look forward to as far as new stuff is concerned. Also targeting more outlets to sell my work through in 2011. I'll keep you posted on any new developments as and when they happen. 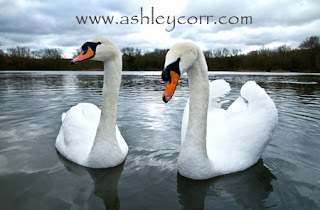 Until then, keep popping back to ashleycorr.com for the latest site updates, as well as new blog entries. Plus there's more TV clips to follow, as well as my own High Definition video clips, captured on my Canon 7D. Until then...ta ta! Two more television clips to bring you, folks. Tyne-Tees television broadcasted one of my photo's last week, on two separate nights. On the first night, my latest shot of the Seven Sisters was shown on the weather bulletin, followed a few nights later during the news bulletin itself, which was a nice surprise. It was picked out by new presenter Kerrie Gosney, who is familiarising herself with the area through photo's like mine, which has a story behind it. The 'Copt Hill' monument includes the round barrow known as Seven Sisters. It is situated in arable land on the western flank of Copt Hill and is 300m south of Copt Hill public house. Excavation of the barrow in 1877 revealed that the primary burial was a Neolithic cremation, believed to be an example of an axial mortuary structure. There were also several Bronze Age cremations and inhumations, and an early medieval inhumation. I've heard a few stories relating to the fact that there any only SIX trees, when there should actually be seven, if the name is anything to go by. One was burnt down by charvers. Others say the Seven Sisters were in reality, seven witches. One of the witches died and that same evening one of the trees was struck down by lightning. What to believe, eh? Leading up to sunset I anticipated a good one. Prior to this particular day we had a few cold and frosty mornings, with decent sunsets, so maybe this occasion would be the pick of the bunch. 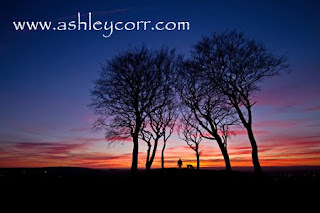 I quickly got my arse into gear and headed up there as the sun dropped towards the skyline, parking in my usual spot in the Copt Hill pub car park. Within five minutes I was set up and ready to go, right in front of the barrow with the sun about to set right behind it. Just then, I was joined by a local fella who I had chatted to briefly the night before as he passed me whilst walking his dog. The visitor, Gordon, from just over the way, knew quite a bit of history surrounding the Seven Sisters. Interesting stuff. I told him I was hoping for a good shot to send in to the people at Tyne-Tees Television. As the clouds turned pink he agreed that tonight was going to be a good sunset and he even took a couple of shots of his own, courtesy of his nice iphone. Might have to get one of those! If you're reading this Gordon, let me know - there's a nice print heading your way with you and your mutt on it! As Gordon and companion crossed over the barrow I quickly tripped the shutter, hoping I'd captured the right moment. I only got one crack at it, as I forgot about setting my camera on continuous shooting mode. I got lucky. One shot and it was a good 'un. Probably my last visit to the Seven Sisters until next winter. I only photograph the trees as a silhouette, when they've shed all their leaves. Not much attraction in the spring and summer seasons, to be honest. I've got to say though, I love this shot, plus the three exposure panoramic sweep I had the foresight to grab while the sky was in 'full bloom'. Here they are. Hope you like them. Hello again. A couple of years ago I submitted a batch of photo's to the BBC Tyne website, which were used in a dedicated gallery to showcase my work. I can't help cringing when I view those pictures now, but I thought they were quite good back then. Anyway, I received an email from BBC Tyne informing me that they'd used a couple of my old shots in a new gallery, featuring illuminated subjects in the North-East. Here's the link - Joseph Swan's light bulb legacy on Tyneside and Wearside. It features two of my shots and these are image 4 and image 7. And just for the record, here's that gallery of images I mentioned earlier - Ashley Corr's Northern Highlights. Until the next time, see ya.